Google Art Project is one of my favorite tools available online. It is a repository of high resolution images and 3D “museum view” virtual art gallery tours. Since its inception in 2011, Google Art Project has grown from its initial collaboration of 17 international museums to more than 151 and is now available in 18 languages. This is a great tool for introducing students to Art from around the world. Here are a few ideas for lesson plans that you can use in conjunction with Google Art Project. Google Art Project will allow you to create and curate your own gallery. You can have students build a project thematically (styles, emotional experiences, etc), chronologically, culturally, and more. Students select the pieces that they want to add to their gallery, move them around (just as a museum curators places art pieces in an exhibit), and then share them privately or publicly. This could be a great way for a student to showcase their understanding of a particular artist or style as a project for an Art History, History, Social Studies, or Humanities course. You will see that I have selected A Sunday on La Grande Jatte by Seurat (Chicago Institute of Art) andBreakfast by Signac (Kröller-Müller Museum); both of these artists were masters of pointillism. I have students examine the pieces in high definition, side-by-side, and explore the different techniques between these two artists. Students write up their comparative analysis in their Art History notebook and present on the stylistic differences in class. This can also help students understand how styles and techniques evolve over time (Seurat and Signac developed pointillism out of the styles of impressionism). You can assign specific works of art to students (like I do above) or you can have students choose and compare pieces on their own. This is a great way to teach students to engage the content in depth and perform comparative analysis. Students could select an artist and study their life, style, work, and technique; the high definition, zoomable figures on Google Art Project allows them to study numerous works of art that are held in collections around the world. After they have done this, ask them to create a fake! They can host a gallery opening where visitors compare their reproduction to the original works of the artist. Google hosts regular Hangouts on Air with prominent curators. They announce the schedule on theirGoogle+ page and post the recordings on theirYouTube page. 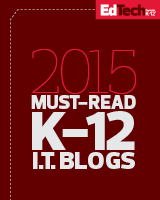 Students can prepare for the announced topic and submit questions to professionals. It’s a great way to engage students with modern Art curation. Google has also posted some different lesson ideashere. With more and more expansions to the Google Art Project (the most recent being its Street Art Collection), there will be more opportunities for students to explore the world of Art. This resource continues to grow and provides students with the ability to explore art in new and interesting ways, outside of a textbook, or more in-depth than they could at a museum. LEARN MORE ABOUT BRINGING GOOGLE INTO YOUR CLASSROOM! This entry was posted in Art History, Education, Educational Resources, Educational Technology, Google, Modern Art, Museums, Technology and tagged Art, Art History, Ed Tech, EdTech, Education, Education Technology, Educational Resources, Educational Technology, GAFE, Google, google apps, Google Art Project, google cultural institute on April 20, 2015 by Jennifer Carey. Google has become one of the most popular tools in schools today. With its broad and flexible system of apps, there are many ways to adapt them into a classroom to help you explore new and dynamic ways of presenting materials or having students build projects! If you teach in the art department (with either Studio Art or Art History), here are three ways to use Google to facilitate your classroom workflow and to allow students to showcase their work. Google Docs is a quick and easy to master word processor. Where it excels, however, is in its ability to track progress, share your work, and collaborate with others both at your school and with peers from outside of your institution. My Art and Art History teachers love using it as a tool for students to write research essays, synopses, or other written assignments. Because of the collaborative elements, it’s an excellent tool for group projects and/or peer editing. When students are finished with a project, they can share the final version with the teacher. With the “revision history” feature, the teacher can track a student’s writing over a period of days and hours, witness group contributions, see how a student incorporated peers edits, and more. Shared folders within Google Drive have so many uses in the world of Art! 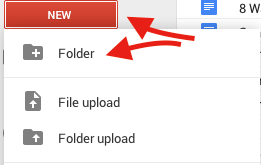 To create a shared folder simply open Google Drive, click “new,” and select “folders.” Give the folder a name and then share it by selecting it with a single click and then choosing the “share” icon. You can share a folder with a single person or a group of people depending on your needs. Students and others can then submit content directly to that shared folder. My Art History teachers love using shared folders as a repository for presentations. Often, high-resolution images of art create robust files that are too large to email. With a shared folder, this is no problem because students can simply upload their presentations directly to it; with Google Apps for Education, there is no limitation on file size or storage, so space is not an issue! With a shared folder for presentations, students can continue to access the content for future reference. In studio art, a shared folder is a good way for students to submit images or videos of their work in progress or as a finished product. As Google Drive has free apps for both iOSand Android, students can also upload directly from the camera roll on their smartphone or tablet! Students in Art classes often have a portfolio of work that they are especially proud of and want to showcase. Google Sitesis a great place for them to highlight their work. A Google Site can be personalized and has the ability to embed images, video, documents, presentations, and even folders from Google Drive, allowing students to create and curate their own digital portfolios. With Google Sites’ shared settings, students can publish their portfolio only to themselves, broaden it to their community (a particular teacher, their classmates, the faculty as a whole, or the school or district), or to the world. Teachers can help students decide their appropriate audience based on their age, school or district policy, or the objective of their showcase. Google’s tools support teachers and students as they produce, share, and curate material across a variety of contexts. While these are three ways that I have seen teachers in Art and Art History use Google in their classroom, how else can you envision using these tools and apps? To learn more about using these tools, EdTechTeacher will be offering a Google & iPads Pre-Conference Workshop as part of their February 9-11 iPad Summit in San Diego. This entry was posted in Art History, Education, Educational Resources, Educational Technology, Google, Lesson Plan, Pedagogy, Technology and tagged Art, Art History, Ed Tech, Education, Educational Technology, GAFE, Google, Google Apps for Education, Google Art Project, Pedagogy on January 12, 2015 by Jennifer Carey.